We will be holding our second coastal marathon walk on Sunday May 20th 2018. A 25 mile walk, will take place from Whitstable to Broadstairs via King George V Park, a 13 mile walk, from Minnis Bay to Broadstairs via King George V Park. A shorter walk of 5 miles, is also planned from Botany Bay Hotel, Kingsgate to Broadstairs via King George V Park. There is an entrance fee of £10 which includes a tee shirt (collected on the day), training program, detailed plan of walk, and full insurance. Only registered walkers can walk and they must wear the tee shirt for insurance purposes. 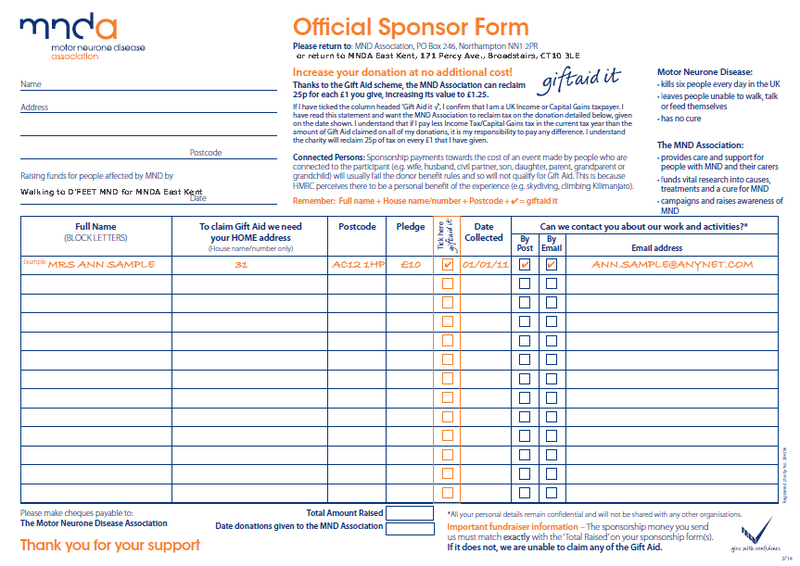 Each walker is requested to find sponsorship to support people living with MND in East Kent. There is no obligation to raise sponsorship but all support is greatly appreciated. To register for the walk, please visit www.mnda-eastkent.org.uk/walk2018 , complete the form, then follow the link to Just Giving to pay your entry fee of £10. If you intend to set up your own JustGiving page, we are happy for you to do so. Please select MNDA as your charity and then please mention MNDA East Kent in your story to ensure that funds you raise are used for people living with MND in East Kent. Once you have set up your JustGiving Page, please link it to our team at www.justgiving.com/teams/coastalwalk2018/join so we can keep track of the total funds we raise. The route is shown on the map above. I’m trying to register a page on the Just Giving site but the link takes me to a list of charities but I can’t find Coastal Walk to D’Feet MND 2018 on the list. How do you open a page for sponsors? PS I’m going to see the old git next week-are you around thurs/fri? Thank you for setting up a JustGiving page to support MNDA in East Kent. Please follow this link https://www.justgiving.com/teams/coastalwalk2018/join then you can create a page with the charity being MNDA. In your story mention East Kent and all funds will go the MNDA in East Kent. If you have any further problems please email me. Absolutely no problem. We hope everyone will be able to get sponsorship but appreciate that some folk cannot. Everyone is welcome to walk once they have paid the registration fee and there is no obligation to raise sponsorship. Thanks for your interest and we hope we shall see you on May 20th. We are grateful if you raise what you can, thank you.